In our hyperpolarized society, people often disparage or boycott brands that work with, are run by, or receive funding from people, groups or institutions whose politics they disagree with. Well, if that describes you, you should probably boycott AllSides. We are not actually advocating that you boycott us, of course. But we want to make it very clear that we are doing something different. AllSides has done the seemingly impossible. We’ve found something both sides of the political aisle agree on: that respectfully listening to understand all perspectives is a solution to navigating our modern world, and that it’s worth investing in that outcome — for the good of democracy. The fact that both sides see our solution as worthy of pursuit makes us feel optimistic about the future. That also means that at AllSides, you are sure to find someone involved who you don’t like or agree with. Our readers are pretty evenly split among left, right and mixed political leanings – about one third each. In that same vein, we have supporters you might consider “evil” from across the political spectrum. That is essentially the point at AllSides. Our mission is to free people from filter bubbles so they can better understand the world — and each other. Luckily, there are people and organizations on both the left and right ends of the political spectrum who share our goal and support AllSides in achieving it. We’re proud to be a group that is bridging divides and is transparent about how we do it. If you want to hate us, that’s OK. We will proudly continue to work with people across the spectrum and be open about it. So without further ado, here are reasons you might hate AllSides. “Your founders are partisan warriors…too extreme." Our founders are from the left, right and middle, and some remain active politically – active and effective enough to potentially upset the other side. 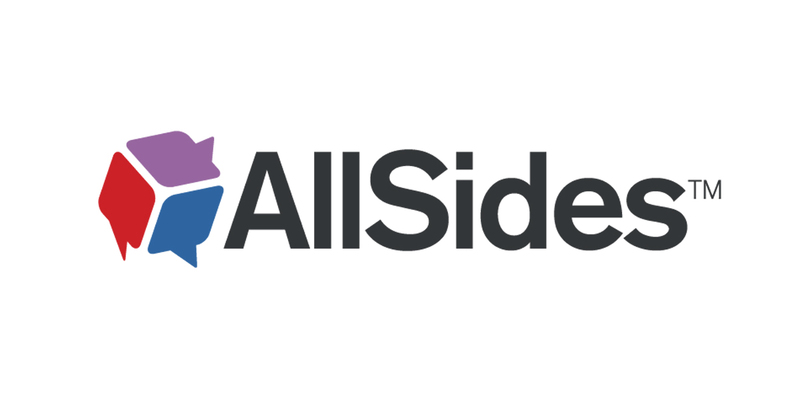 This political mix is part of what makes AllSides great, and we are very proud and transparent about it — we even list the political biases of AllSides staff on our team page. Prior to his career in technology, AllSides co-founder and president John Gable was a professional Republican operative who worked for President George H. W. Bush, Senator Mitch McConnell, and the Republican National Committee. While he now lives in San Francisco, John is originally from Kentucky coal mining country, which has become a heartland of Trump supporters. He remains a proud, active Republican today. Joan Blades, co-founder of our non-profit schools program and our partner Living Room Conversations, co-founded the progressive groups Moms Rising and MoveOn.org, which has raised millions of dollars for left-wing candidates. She is from Berkeley — one of the most progressive areas in the country. She still lives there and remains a proud, active Democrat today. Scott McDonald, co-founder of AllSides and technology lead, is more centrist and less active politically. As an early online community entrepreneur, he remains dedicated to transparency, and that feeds his passion for revealing media bias across the political spectrum. However, he did intern for Republican Slade Gorton in the 1990s. AllSides is proud to be a mix of people from all over the political bias spectrum. Take a look at the TED Talk that John and Joan did together on bursting filter bubbles to see just how we work together across our differences for the common good. We frequently get compliments for how transparent we are about the political biases of AllSides team members. That sometimes also leads to concerns from the left and right. For example, there are twice as many people working for us who fall on the left side of the political spectrum than from the right. While the team has more women than men, only 10 percent are people of color. We also hail from all over the country, which provides us with a diverse mix of experience and values. 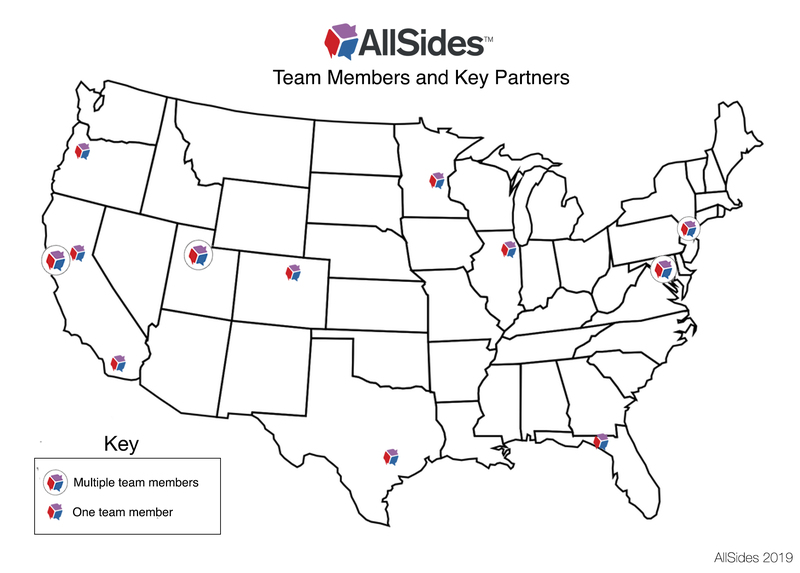 Take a look at this map showing where AllSides team members and key partners are located. Beyond this, we have even more geographical and cultural diversity when you consider where our team members were raised, adding places like Kentucky, Ohio, Washington and Pennsylvania, and countries including Russia, India and France. While AllSides isn’t a perfect 50/50 split of men and women, liberals and conservatives, white people and people of color, our background is collectively diverse and we represent many different viewpoints, experiences and perspectives. Most news media business models reward sensationalism and partisanship. In other words, their business models reward bad behavior. AllSides created a unique business model that actually encourages good journalism. A major part of this is that we provide services to schools and nonprofit organizations dedicated to bridging divides. If we were ever to lose our balance, we would lose these customers and the funds we get from them. We also raise money from individuals dedicated to balanced journalism, civil conversation and bridging divides. Some of these organizations have received donations from individuals or organizations that fund partisan activities. Some of our individual donors have been active supporters in partisan politics on the left and right. For example, we have partnered and received some funding from some organizations that are dedicated to bridging divides, and many of these are run mostly by people from the left. Some have received money from people like Tom Steyer, billionaire donor and leader of progressive causes. He is currently funding an impeachment campaign among other causes, and is often vilified by conservatives. AllSides has also worked with organizations and received funding from the Charles Koch Foundation. Like Tom Steyer on the left, Charles Koch is a wealthy supporter on the right, supporting conservative causes and candidates. Sure, Koch often funds traditionally liberal causes, including free press, free speech, and education, and that is how we have worked with them, but they are often vilified by progressives. We are proud to receive support from groups like these. While some might cite this as a reason to hate us, we take a different view. The fact that people from both sides of the aisle believe AllSides holds a solution to our hyperpolarized and partisan society and are willing to invest in the solution gives us hope for the future of our nation. Sometimes those on the right point out that nonprofits can become unaccountable and ineffective, wasting money or becoming almost entirely controlled by one big donor. Some may be concerned that AllSides for Schools is a nonprofit vulnerable to being hijacked by a big money special interest with a partisan agenda. On the flip side, AllSides.com is a for-profit company. One of our goals is to develop a media business model that rewards good behavior, unlike the modern media model most use, which encourages partisanship and tribal outrage. Yet some may wonder what would prevent our good mission of bursting filter bubbles and bridging divides from being thwarted by the profit motive. We believe there are pros and cons to both nonprofit and for-profit models, and that is one of the reasons we work in both worlds – to balance out the dangers and to better support our mission. For people who hate or fear the other side and want to build up anger, we’ve laid out plenty of points you can use. As you can see, AllSides has ties with a variety of groups, individuals and organizations that folks on the other side might find unsavory. But that's part of the point of AllSides: to bring together people who might otherwise disagree in order to work toward the common goal of understanding the world and each other better. When we refuse to work with people who are different than us, we run the risk of not understanding them or being mislead into thinking they are "evil." At AllSides, we strive to create friendly partnerships with those who are devoted to better understanding one another — and we strengthen our democracy in the process. If you still have honest concerns, check out some more answers in our FAQ. And if you are tired of the sensational outrage, deepening divisions and polarization that seem to be paralyzing our country and the rest of the world, we hope that you will consider AllSides as a friendly partner devoted to strengthening our knowledge and understanding of one another — in order to build a stronger democracy. John Gable is the co-founder and CEO of AllSides.